A hypersonic glider launched Thursday by the U.S. military was lost in flight, the second straight mishap crippling the Pentagon's desire to develop a strategic weapon to deliver conventional munitions anywhere in the world in less than an hour. 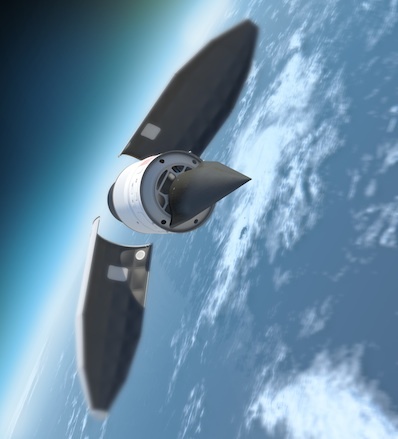 After a successful launch aboard a Minotaur 4 rocket, the arrowhead-shaped Hypersonic Test Vehicle 2 separated and transitioned to aerodynamic flight at a speed of Mach 20, according to the Defense Advanced Research Projects Agency, or DARPA. The military said they collected more than nine minutes of data before an anomaly caused a loss of signal from the hypersonic glider. Ships, aircraft and other tracking assets were in place to receive communications from the high-speed vehicle. Liftoff occurred at 7:45 a.m. Pacific time (10:45 a.m. EDT; 1445 GMT) from Vandenberg Air Force Base, Calif. It used a three-stage version of the Minotaur 4 rocket, which is powered by retired Peacekeeper missile motors. The flight should have lasted more than a half-hour before impacting the Pacific Ocean near the U.S. Army's Reagan Test Site at Kwajalein Atoll in the Marshall Islands. Initial indications are the aircraft struck the Pacific Ocean along the planned flight path, according to DARPA. A nearly identical test vehicle launched in April 2010 also ended prematurely after the craft lost control. Engineers adjusted the second HTV's center of gravity, modifed its angle of attack, and designed it to use thruster jets to help the vehicle control itself. "We know how to boost the aircraft to near space. We know how to insert the aircraft into atmospheric hypersonic flight," said Air Force Maj. Chris Schulz, DARPA's HTV 2 program manager. "We do not yet know how to achieve the desired control during the aerodynamic phase of flight. It's vexing; I'm confident there is a solution. We have to find it." After being released from the Minotaur's third stage, the glider was supposed to orient itself for entry back into Earth's atmosphere, then pull up to begin a long-distance glide toward an impact site in the Pacific Ocean. Thursday's mission, named HTV 2b, was supposed to try out gliding, aerodynamic maneuvers and control algorithms in the hypersonic flight regime at the edge of space. Schulz said three major technical challenges exist within the HTV 2 flight envelope, including aerodynamic, aerothermal and guidance, navigation and control. After reaching its peak velocity, temperatures outside the craft's insulated skin were expected to reach 3,500 degrees Fahrenheit. "Prior to flight, the technical team completed the most sophisticated simulations and extensive wind tunnel tests possible," said Regina Dugan, director of DARPA. "But these ground tests have not yielded the necessary knowledge. Filling the gaps in our understanding of hypersonic flight in this demanding regime requires that we be willing to fly." In a written statement, Dugan said DARPA will resolve the issues with hypersonic flight and try again. DARPA said the data reviewed from Thursday's flight will inform policy, acquisition and operational decisions for the future of the Pentagon's Conventional Prompt Global Strike programs. The HTV test program was part of DARPA's Falcon project. The Defense Department is attempting to develop a conventional global strike weapon to augment the military's nuclear deterrent. It would be able to hit a target anywhere in the world in less than an hour after launching from the United States or a U.S. military base. The Air Force was planning to launch a Conventional Strike Missile on another Minotaur 4 rocket in 2013. Packed with munitions, the missile would have separated from the booster like the HTV and glided to a precise target more than 4,000 miles downrange in the Pacific Ocean.